At the beginning of the twentieth century, human beings finally acquired the godlike gift of freedom in the shape of the automobile. Everyone wants a car. And as soon as the money is there, everyone buys one. The car has utterly transformed our lives. Whether we shall survive it is another question. 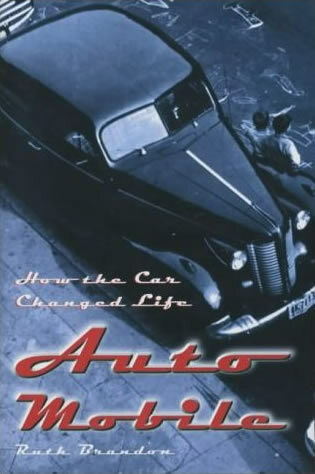 In a series of explorations at once historical and actual, from the Paris of the first road-races to Ford’s Detroit, Hitler’s Berlin and the fragmented world of the Los Angeles freeways, from class war to the automobile suburb and the fantasy life of John DeLorean, Automobile follows the car’s momentous journey as it shapes the twentieth century, and sets the terms for the twenty-first. It traces the pattern of automobile history in which the promise of dreams fulfilled is followed, time and again, by a wholly unexpected comeuppance, and ends with the question nobody dares ask: What will happen when the oil runs out? Oil production will peak very soon – some think as soon as 2006; at the most optimistic estimate in 2020. This is the moment known in the jargon as the Big Rollover. At that point, demand will outstrip supply and the age of cheap travel will end. This entry was posted on Sunday, March 21st, 2010 at 5:40 pm	and is filed under Non Fiction. You can follow any comments to this entry through the RSS 2.0 feed. Responses are currently closed, but you can trackback from your own site. One of the most interesting (and sobering) aspects of writing this book was researching the Big Rollover. This is the jargon term for the moment when world production of oil peaks. This will probably occur around 2010 – in eight years; if the most optimistic estimates are used, the moment may be postponed ten years, to 2020. There will still be plenty of oil left – as much, in fact, as has already been extracted. But from then on production will begin to fall, and what is left will get progressively harder to extract. Meanwhile demand is rising inexorably. Global demand for oil is currently rising at 2 percent a year. Since 1985, energy use has risen by 30 percent in Latin America, 40 percent in Africa and 50 percent in Asia. The US Energy Information Administration forecasts that worldwide demand for oil will increase 60 percent (to about 40 billion barrels a year) by 2020. But by then production will almost certainly be in decline. And what will happen then? What is surprising is how little discussion of this fast-approaching event is taking place – perhaps because the consequences are so enormous as to be almost unthinkable. As the oil blockades of autumn, 2000, showed, Britain is so geared to road transport that within four days of petrol becoming unavailable, the entire country – hospitals, food deliveries, schools, factories – ground to a halt. And the same is true of every advanced economy. Of course oil will not become unavailable after the Big Rollover: as much will be left in the ground as has been consumed over the past 200 years. But – leaving aside the question of what burning all this up may do to our climate – it is clear that the laws of supply and demand – in this case rapidly rising demand and dwindling supply – will mean the end of cheap transport: the sine qua non upon which our entire society is predicated. What will be the effects upon work habits, property prices, food prices? Should we be planning to expand our airports when air travel, in particular, seems set to become a luxury? Oil is not only cheap (aviation fuel is untaxed) but light and energy-dense: crucial for air travel, and not true of any alternative fuel. Where, in Britain, is the will to invest in public transport as a viable alternative to road travel? And how, in the low-density autosuburbia of the United States, would this be possible even if the will was there? The most usual response is to assume that something will turn up – some alternative fuel, some way of using less fuel. And this is of course true. Hybrid cars, alternating between internal combustion and electric, are already available, and will do 100 mpg (though gas-guzzling SUVs remain the public’s vehicle of choice). Cars already exist that will run on hydrogen, which is generally assumed to be the fuel of the future. But where oil gushes out of the ground more or less ready to use, hydrogen, like all the other alternative fuels (biodiesel, oil from coal) will have to be manufactured – which takes energy and expense. Plus, it will have to be manufactured in vast quantity. One of the few to address the question directly is oil economist David Fleming in his article ‘After Oil’, Prospect, Nov. 2000 (http://www.prospect-magazine.co.uk). See also ‘Kicking the Habit’, New Scientist, 25 November 2000 – an excellent overview of developments in this area.